The invention concerns a ventilator device according to the preamble to claim 1. Ventilator devices, specifically extractor hoods, with a suction filter, a suction motor arranged in a suction chamber and an exhaust path connected to the suction chamber are known in a wide variety of configurations, in particular as kitchen fittings. Fat is removed from the extracted air by means of the suction filter equipped with replaceable or washable filters (fleece filters or metal filters) and installed above the hob. Non-deodorised air still containing particles is conducted into the open. The suction motor fixed above the suction filter makes a considerable amount of noise, particularly on a powerful extraction setting. A smoke extractor according to document US-A- 5 268 012 is equipped with a housing, a sucking port, a motor-powered ventilator (impeller), an annular filter element and an outlet. However, it is not equipped with a filter or any kind of sound insulation on the side of said sucking port and ventilator and motor fitted with radial guide vanes, which means that there is no air-purifying filter or noise protection for an operator standing next to or underneath the ventilator. The sound made by the ventilator and the motor diffuses uninterrupted into the environment. The annular filter element is clearly in the outlet area, that is, where the ventilator expels the extracted air, and not on the inlet side. Document EP-A-0 875 278 describes a modular dual-action filter having a shallow container with several openings for filling with active charcoal granules, above which there is a synthetic filter closing said openings. This may be suitable for filter units in office buildings or similar. The problem underlying the present invention was to create a simple ventilator device that allows for efficient ventilation in a room with considerably less nuisance from noise. According to the invention, this problem is solved by a ventilator device having the features of claim 1. Further preferred designs of the ventilator device according to the invention form the subject-matter of the dependent claims. If as per the invention the suction motor is enclosed in the suction chamber by an absorption filter performing an air-purifying function and a noise insulation function, the air can be effectively extracted from a room without making a troublesome noise and purified deodorised air is passed into the exhaust path. This air can even be conducted back into the room, a function which can save energy, particularly in winter. The invention and its further advantages are set out in more detail below with the aid of the drawings. Figure 1 is a schematic depiction of a longitudinal section of an extractor hood according to the invention. Figure 2 shows a three-dimensional view of a cassette fillable with an absorption agent for the extractor hood in figure 1. As an example of a ventilator device, Figure 1 shows an extractor hood 1 which could, for example, be fitted in a kitchen by fixing to a ceiling or wall above a hob and which has an outer housing 1' and an inlet side 2 in the lower section. This outer housing 1' contains a suction chamber 6 with a suction motor 7 arranged inside it for extracting the air. The suction motor 7 driven by an electric power unit 7' is, by way of example, cylindrical in form and has an opening 24 at each front end for air intake and an exhaust path 9 on its upper side. According to the invention, the suction motor 7 in the suction chamber 6 is enclosed by an absorption filter performing on the one hand an air-purifying function and on the other hand a noise-insulation function. In the present embodiment the absorption filter is formed of planar cassettes 10, 11, 12 filled with an absorption material and enclosing the suction motor (7). These cassettes 10, 11, 12 are filled with, for example, active charcoal 10', 11', 12' and formed so as to allow air to permeate. Moreover, a chamber 21 is located between these cassettes and the outer housing 1'. Appropriate wall coverings 12", for example special fabrics, could additionally serve as a pre-filter. The individual cassettes 10, 11, 12 are each held in guide rails 22, 23 within the housing 1' such that they form a box and so form a closed space enclosing the suction motor, thereby fulfilling the desired noise-insulation function, with the result that a person standing next to the extractor hood hardly hears a running suction motor. Furthermore, on the inlet side with the cassette 11, there is a servomotor 27 interacting with the latter and fixed to the guide rails 22. This servomotor 27 can, via a circuit not shown in greater detail, be controlled in such a way that the air is released through to the side between the cassette 11 lowered by the servomotor 27 and the upper cassettes 10, 12 at the guide lanes 22 shown by arrows 26, and so brings about a short circuit so that most of the drawn-off air flows directly to the suction motor and not through the filters. The servomotor 27 is advantageously used as a bypass when there is temporarily a large amount of steam, for example when meat is fried. For this, the highest extraction setting is enabled and the polluted air is directed straight outside. This allows a higher extraction capacity to be reached and spares the filters. However when the extractor hood 1 is operating normally, the lower cassette 11 is pressed against the side cassettes 10, 12 and the air is exclusively directed through the filters. As on the inlet side, the exhaust path 9 is preferably provided with an upper housing 30 with inset cassettes 33, 34 containing active charcoal which are likewise held by guide rails (35). Between the outer housing 30 and the cassettes, a chamber 36 surrounding the latter is arranged. The air transported from the suction motor 7 is conveyed through said cassettes into the second chamber 36 to an outlet 37, where the purified air is either directed outside or recirculated back into the room. In the upper cassette 34 there is again a servomotor 27, analogous to that installed with the lower cassette 11, which can be advantageously activated simultaneously with the lower servomotor 27, adjusting the corresponding cassettes 11, 34, so that the air can pass more quickly at the open positions, as indicated by arrows 28. As a result of the noise-insulating effect of the absorption filters 10, 11, 12 the extractor hood 1 according to the invention can, for example, also remain switched on at night and clean the air. The air could even be conveyed back into the room, with the extractor hood being set in circulation mode and so practically used as a recirculation hood or an air-conditioning device. The extractor hood could also be equipped such that air extracted as a secondary intake is drawn off from another room through, for example, a connecting shaft and cleaned. It would then need to be fitted with a pipe or similar leading into the chamber 36, as well as with an additional connecting pipe from said chamber 36 into chamber 21 to convey the extracted air through the filter either to the outlet 37 or back into the room. The cassettes 10, 11, 12 containing the absorption material can also be fitted into the filter such that they can be removed. They can then be replaced after a certain period of time. Figure 2 shows an embodiment of a replaceable cassette 10a, specifically a side cassette around the side of the suction motor 7. The cassette 10a has a rectangular frame 40 divided by several parallel wall components 41 partitioning it into a number of compartments 42 which can be filled with the absorption material, for example active charcoal. A cross brace 39 joins the wall components 41 to each other and to the frame 40. The front of the compartments 42 and the frame are covered, for example, with a filter fleece 43. Guide elements 44 are attached to the side of the frame 40, enabling the cassette 10a to be inserted into guide lanes of the housing, such that the compartments 42 of the inserted cassette 10a stretch from the inlet side 2 up to the exhaust path 9. This allows for an even distribution of the active charcoal or other absorption material. The frame 40, or at least its upper side facing the exhaust path 9, is fitted with ribs 45 projecting into the partitions 42 and connecting the wall compartments 41 to form a sort of screen which prevents gaps through which air could pass unfiltered from being created by sinking of the active charcoal or other absorption material as a result of vibration. Ribs 45 are preferably fitted also on the lower inlet side of the frame 40, so that the cassette 10a can be inserted either way into the housing. The invention has been sufficiently explained in the above embodiments. Naturally, it could also be embodied in other variants. For example, the suction motor 7, together with the absorption filter, could also be contained in an extractor hood mounted on a wall. The suction motor 7 would then be analogously enclosed by the absorption filter 10 such that the air is extracted through the filter and the intended noise-insulation effect achieved. A conventional removable metal filter or similar could additionally be fitted on the inlet side 2 to collect large pieces of fatty residue. 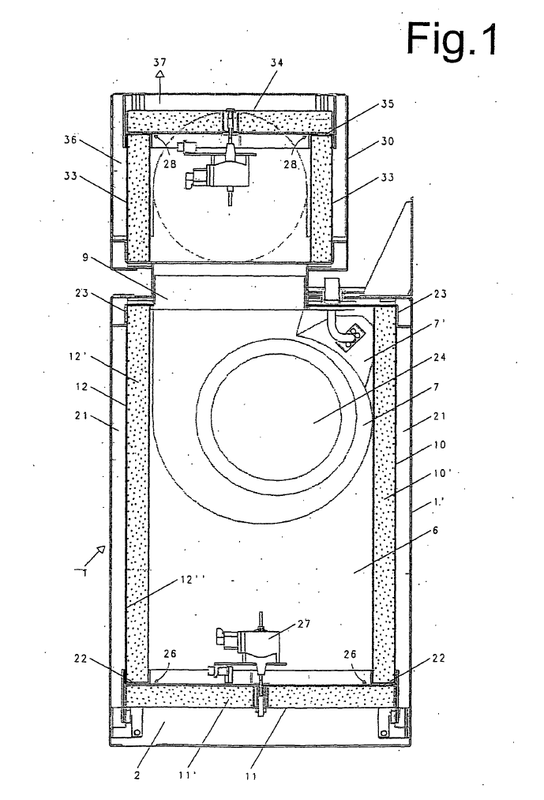 Instead of using cassettes, a box-shaped filter unit enclosing the suction motor and with walls filled with absorption material could be installed in the external housing. Flushing (or regeneration of) the absorption filter would also be possible if fresh air from outside were pumped through the filters in the opposite direction. Naturally, this ventilator device is also suitable for uses other than as an extractor or recirculation hood. It could be used as a cleaning module for other appliances. A filter fleece could be used on the outside of each cassette as a cover, insert or pre-filter for the absorption material, particularly with a view to protecting the absorption filter. 1. A ventilator device with an inlet side (2), a suction motor (7) arranged in a suction chamber (6) and an exhaust path (9) connected to the suction chamber (6), characterised in that the suction motor (7) is enclosed on the suction side in the suction chamber (6) by an absorption filter performing on the one hand an air-purifying function and on the other hand a noise-insulation function. 2. The ventilator device according to claim 1, characterised in that the absorption filter comprises planar cassettes (10, 11, 12: 10a), each filled with active charcoal. 3. The ventilator device according to claim 2, characterised in that the individual cassettes (10, 11, 12; 10a) are respectively held in guide rails (22, 23) within the housing (1') such that they form a box and so form a closed space enclosing the suction motor (7). 4. The ventilator device according to claim 3, characterised in that between the side cassettes (10, 12; 10a) and an outer housing (1') a first chamber (21) is provided through which the air from the inlet side (2) is conveyed to the side cassettes (10, 12; 10a). 5. The ventilator device according to any of claims 1 to 4, characterised in that the primary air sucked via the filters of the inlet side (2) from a room into the suction chamber (6), conveyed via the absorption filter into the exhaust path (9), can be conveyed back from the exhaust path (9) into the room. 6. The ventilator device according to any of claims 2 to 5, characterised in that on the inlet side with a lower cassette (11) a servomotor (27) interacting with the latter is provided which is controlled such that the air passes through to the side between the lower cassette (11) lowered by this servomotor (27) and the side cassettes (10, 12; 10a) and so brings about a short circuit so that most of the drawn-off air flows directly to the suction motor and not through the filters. 7. The ventilator device according to any of claims 1 to 6, characterised in that with the exhaust path (9) an upper housing (30) with cassettes (33, 34) placed inside the latter and containing the absorption material is provided, between the upper housing (30) and the cassettes (33, 34) a second chamber (36) being allocated, the air conveyed by the suction motor (7) being guided through these cassettes (33, 34) into the second chamber (36) through an outlet (37) into the open or back into the room. 8. The ventilator device according to claim 7, characterised in that ambient air can secondarily be sucked into the first chamber (21) enclosed by the outer housing (1') or into the second chamber (36) enclosed by the upper housing (30) and by means of a connection shaft into the first mentioned chamber (21) and, cleaned by the suction motor, can be brought back to the exhaust path (9) or to the outlet (37) into the open or back into the room. 9. The ventilator device according to any of claims 1 to 8, characterised in that flushing or regeneration of the absorption filters is provided with which fresh air from the outside is pumped through the filters in the opposite direction. 10. 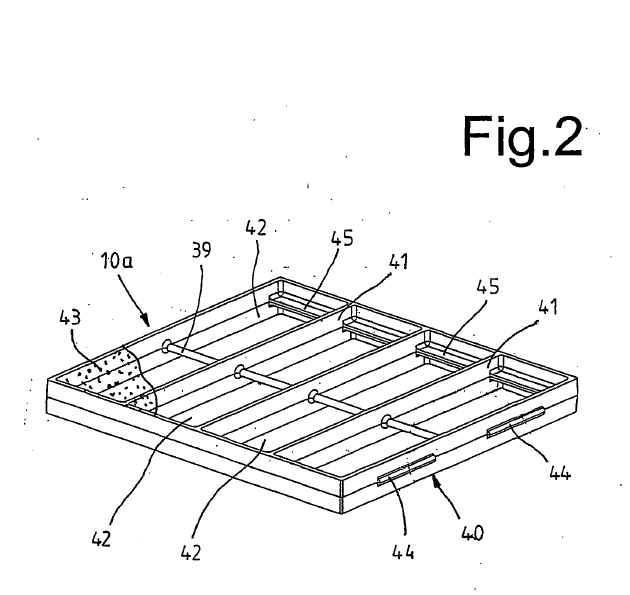 The ventilator device according to any of claims 1 to 9, characterised in that a filter fleece is used as a covering, insert or pre-filter for the absorption material.